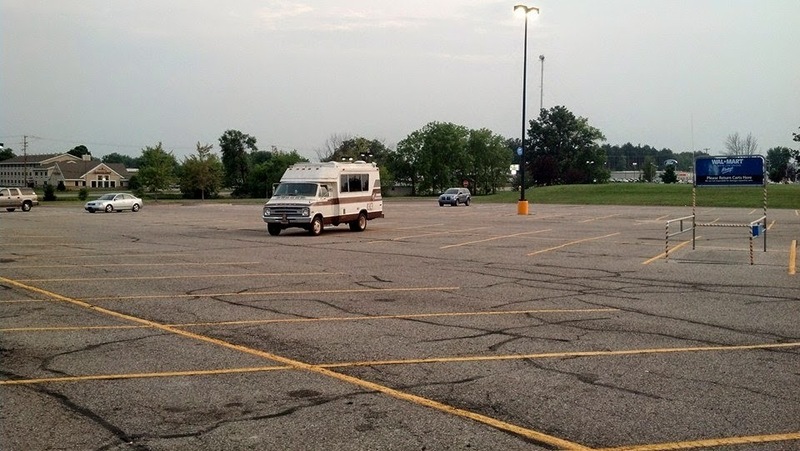 Last night was the first time I walked out of a Walmart and back to my RV. The first of many, I hope. Haha. The scene above is typical of that Walmart. Lots of parking. Also, like normal, there's never any RVs. You don't see too many in parking lots in Michigan. I was the only one for the short time I was there. My biggest fear of the trip was almost realized. It started very hard on the way out. So I need to figure out what that's about. Otherwise, it's still running great and I had fun just cruising around for about 40 miles. I felt very on display for the few moments I was hanging out in back. Obviously if I was parked with the intention of staying awhile I'd probably tuck myself along the edges or something. Still, that will be one of my biggest obstacles when and if I launch myself into the mobile lifestyle. Feeling comfortable anywhere I go. I realized while I was there that I had electricity, in both 12v and 110v. I had a fridge. I had a stove. And I had a shower and a toilet. I could have showered right there in a Walmart parking lot. I could have made a meal. It was a powerful moment of true freedom. I couldn't have actually showered though. Almost. I redid all my plumbing yesterday as well. There's not much of it. The hardest part was limited access and tight spaces. I'm happy to say all my new lines are good and they don't leak. Unfortunately, it's still leaking right at the tank. So I drained everything again and I still need to get back out there. It's one of two things. Either the vinyl tube isn't clamped down enough (probably) or the actual fitting into the tank is loose. Easy enough to fix. Looks really good and doesnt even completely scream rv. Glad to see youve got it out and about!